I know as women, we’ve always aspired for that coke bottle shape but some celebrities take it too far. Look at Kim Zolciak below. This is ridiculous and it looks uncomfortable and unnatural. I know that when you take the waist trainer off, your waist expands out a little but omg! Khloe’s waist training looks more reasonable. I love Khloe by the way. I wish I had her body, waist trainer or not. She’s perfect to me. 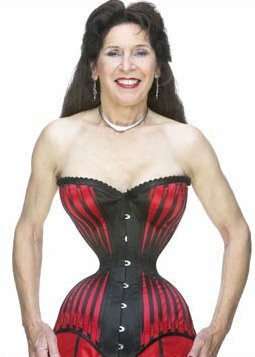 Even Kim K’s waist training looks reasonable too. Doctors even tell you that there are health risks outside of cracked or broken ribs but when has the pursuit of beauty gone too far? This is one step in that direction among a lot of others. Pics from dailymail.co.uk, yahoo.com, scoopnest.com, cheeju.wordpress.com. Corsets left fashion for a reason!